A Christian author from Pennsylvania dissents from majority opinion on the events of the Last Day return of Christ. Walter Madenford puts the theology of the pre-tribulation rapture under the microscope. First published 15 years ago, “Going Against the Tide Prophetically” sheds new light and casts new perspectives on the author’s pre-tribulation viewpoint of the rapture. During his guesting on Ric Bratton’s radio program This Week in America, Madenford told the host he is going against the majority opinion on the events of the Last Day return of Christ. Drawing on nearly 60 years of his own interest in the subject, Madenford offers his unique viewpoints on the current state of biblical, millenarian prophecy, especially pre-tribulation theology, a belief system that states that the rapture will take place before the Second Coming of Christ. Like his evangelical brethren, the author quotes prophecies from Daniel, Ezekiel, Joel, the Gospels ‘Other than the books of Daniel and Revelation the Olivet Discourse is a main source of information on end time events,” and Revelation. Madenford sees prophecy as unfolding in the modern world. Contemporary nation-states, such as Russia and Britain, he speculates, represent various “beasts” of prophecy, as does the Roman Empire. He even presents theories about whom the “antichrist” might be and scenarios of world war might play out based on contemporary geopolitics. He connects Chinese bomber jets, nicknamed “flying leopards” to prophetic winged beasts and Russia to biblical references to a great bear. “Going Against the Tide Prophetically” includes many corrections and alterations to some long-held views on the pre-tribulation rapture. It is his persuasion that there should be many corrections made, not to the framework but to the many details of this view. “After much thought, I have decided not to present a view toward which I lean, but cannot be dogmatic about, but rather to present various bits of information generally overlooked, and allow the reader to make up his or her own mind,” said the author. 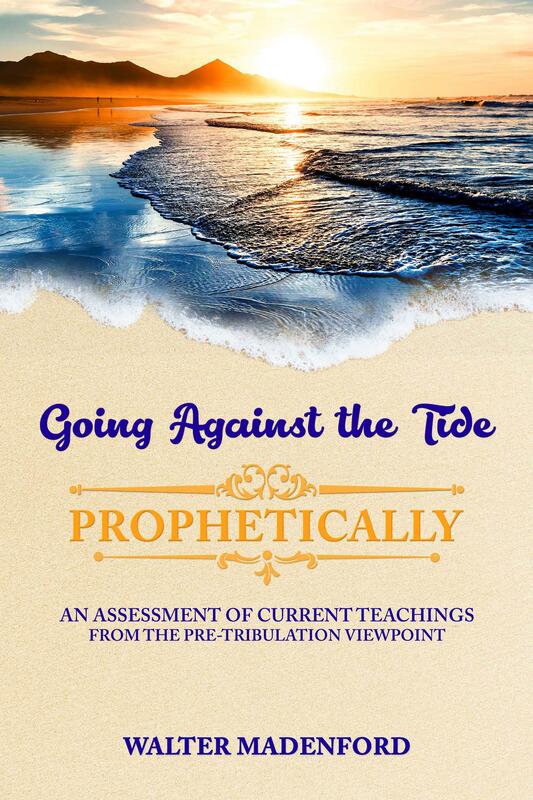 Order Walter Madenford’s “Going Against the Tide Prophetically: An Assessment of Current Teachings from The Pre-Tribulation Viewpoint” today. Copies are available at Amazon and Barnes & Noble. Walter Madenford lives in Philadelphia, PA. With well over 57 years of searching Scripture with his graduation from the evening school division of Philadelphia College of Bible (now CAIRN University) over thirty years ago, he felt that the accumulated knowledge of those years should be shared with others. It is left up to the reader to decide whether this “elder” has been led astray by evil powers or perhaps by his own imagination, or whether the Spirit of God has illuminated (not inspired) his mind in his search for truth.